The whole of last month I’ve been talking about party sailing in Croatia – a hedonistic holiday unlike anything you have ever experienced. Now, the question isn’t whether you should go but who you should go with. You’ve got the questions and I’ve got the answers! But is that who should you go with? Today I am bringing you a full, true, unedited review of Sailing.hr. Are they reliable? Should you book with them? Read on to find out! I’ll be honest with you – I hesitated with posting this review for a long time. My trip with Sailing.hr is the first comped trip I ever got through this website – woo! – and I feared publishing anything other than a glowing recommendation would reflect badly upon me as a blogger. But earlier today I had a conversation which made me realise how silly I was being. This blog is a place where you can find unfiltered, honest travel advice and I’m not going to change that just because I got a freebie. I’m never going to change that because I love you too much to lie to you. So, without further ado, here is the full review of my party yachting trip with Sailing.hr. Sailing.hr is a Croatian company with local skippers who know the waters very well and can speak the local language. This gives the company a clear edge over many of its competitors – who wouldn’t want to sail with those who know the area the best and support local businesses? This is one of the main draws of Sailing.hr, but in reality it contributes little to your experience. Our skipper sometimes told us little pieces of trivia about the islands we were about to visit, which added a little dash of culture to the otherwise thoroughly hedonistic experience. Should you choose your provider based on this though? Nope. Unlike its rival Yacht Week, Sailing.hr is a relatively small company. It has a smaller fleet, fewer crew members and hence lower numbers of weekly participants. Let’s put this into numbers – during my visit there were 13 boats sailing. When I watched the company’s trailer posted above, they talked about having 120 boats so this was basically a tenth of what I’d expected. Now, I must point out that the weather was direly bad – think rain, storms and an omnipresent cold which forced me to cover my bikinis with bulky sweaters. In short, ugh! According to the skipper, there were more than 30 boats sailing the week before – however, that is still nowhere near 120! I’m actually a big fan of smaller companies – they are easier to manage which can avoid a lot of potential stress and travelling with them can create a nice sense of community. But the problem with having fewer boats is that the exclusive parties don’t quite work, because there simply aren’t enough people to make them awesome. When it comes to partying, there really is strength in numbers and all those incredible beach locations need a big crowd to do them justice! The event Sailing.hr threw in cooperation with Yacht Week at Aquarius club in Komiža was among the best of the week… and sadly it wasn’t the company’s doing. In fact, that night we all felt like second class citizens compared to Yacht Week guests – the buses for Sailing.hr guests ran at an inconveniently early time because all the later ones had been reserved for Yacht Week people. In other words, it was clear who was a valued guest and who wasn’t. We decided to take a taxi to avoid going to the party at 8pm and awkwardly standing around for hours – and the taxi ended up being cheaper than what the bus ride organised by Sailing.hr would have cost us! One of the appeals of travelling with Sailing.hr are their price incentives. The company runs 50% off deals for girls thanks to which my friend Lyna scored a cabin on the boat for €250! Let’s do a little comparison… When I was staying in a hostel in Split, only metres away from where our sailing boat had been docked, I paid €20 per night – at €250, Lyna was paying €36 per night on a gorgeous sailing boat with a skipper! Not a bad deal if you ask me. Unfortunately, nothing in life is free and there are quite a few extra costs involved. There are the docking charges, money for gas and food for the skipper. All of these are mentioned on the website, but it’s easy to overlook them or underestimate just how much they can add up to. Each passenger of my boat ended up paying at least €50 in docking fees and 80 kuna (€10) for petrol at the end of the trip. There are also transport costs – none of those boat taxis and bus rides you will need are included in the base rate. Food and alcohol expenses obviously depend on each individual’s preferences but most crews put money together to use for covering these costs as a group. We did the same and I’d recommend that approach, as it’ll save you a few of headaches along the way. On a side note – I hadn’t realised just how expensive Croatia has become. Once upon a time many Czech families including mine made a habit of vacationing in this lovely country because of its relative proximity and the low prices, but affordability is a thing of the past now! Eating out, sipping on drinks and partying in funky clubs – the three vital ingredients of a good party vacation – will cost you as much as it would in a place like London. You’d do best to keep that in mind when planning your holiday and calculating an appropriate budget. All in all, the extra costs payable to Sailing.hr hovered around €100, while food and booze cost Lyna and I upward of €200 each – and that’s only because we let attractive men buy us drinks at parties. As a hosted blogger, I actually wasn’t supposed to pay any of these additional costs which was clearly stated in the contact I signed. Due to mismanagement on the company’s part I was made to pay all of them and have never received remuneration – in fact, I was indirectly told that I would only be paid if I posted a review which benefited the company. In other words, I’d only be paid if I told you half-truths and pretended I had no issues with the company. Well, that’s just not how I roll! Keep in mind that there is also a refundable deposit of €1,500 per boat, which you must pay on the first day. In theory it could be divided into equal parts among passengers, but the company discourages this as it means extra work for them. In our case, they let three of us pay for a crew of eight. If you are sailing with a bunch of strangers as Lyna and I were, this can be a little awkward and scary. Of all the people I’ve spoken to on the trip, everyone got their full deposit back – but it took the bank a few weeks to release the outstanding payment of €500 on my card, which was annoying. This, I should point out, was not Sailing.hr’s fault but the rental company’s. There is one more expense you have to be aware of and which probably causes the most controversy. Upon boarding your boat, you have to pay €80 for a wristband whose sole purpose is providing club entry. We actually only paid €50 because the big pirate ship which was meant to host one of the main parties had been destroyed and hence couldn’t be used on our week – but that was no consolation, especially because no one had bothered to tell us the boat would be defunct in advance and we’d all been looking forward to partying on it! I’m on a boat motherfu… Can you spot me? That last point really hits close to home – many of the people I spoke to had only chosen Sailing.hr because they couldn’t find a spot aboard one of the Yacht Week ships. That in itself speaks volumes. There are quite a few activities which you can take part in outside of sailing. Snorkeling, scuba diving, jet skiing… The list goes on. Unfortunately, due to bad weather we got offered exactly none of those. Hell, we couldn’t even visit the beautiful blue cave near the island of Vis – a day trip everyone on my boat was really looking forward to. The company are hardly to blame for bad weather, but looking back I’m not certain all those omissions were a result of bad weather. To be fair, I did go on one trip organised by the company – wine tasting in Hvar, which I did enjoy. For about €20 we got to sample devour five big glasses of wine and a freshly caught fish (freshly caught and cooked, that is) whilst surrounded by a friendly troupe of donkeys, cows and kittens. If only the entire trip had been that well organised! Just a cow judging me for my excessive wine consumption. Would I go party sailing again? YES, YES, YES! Would I do it with Sailing.hr? Eh… nope! I had a really good time during my week of party yachting in Croatia, but it wasn’t because of Sailing.hr – it was despite them. In fact, the best bonding moment for our boat mates, Lyna and I was when we all started talking about how poorly organised the entire trip was. I’d thoroughly recommend party yachting to any single twenty-something looking to have fun and unwind in style in the summer months. However, I don’t think Sailing.hr is the best option out there and going with Yacht Week might be a much better bet. Whenever I saw Yacht Week guests out and about, they looked like they were having so much fun and I’ll admit I was a little jealous of them! Having said that, I’ve never dealt with the latter company and cannot speak to their quality. Whichever provider you choose, you do have to keep all the extra costs in mind before booking your ticket – the extra changes I mentioned above are not exclusive to Sailing.hr. All the companies operating in the area charge these fees, so you cannot avoid them regardless of who you go with. Have you ever gone party sailing in Croatia? Who was your provider and what was your experience with them? Would you do it again? 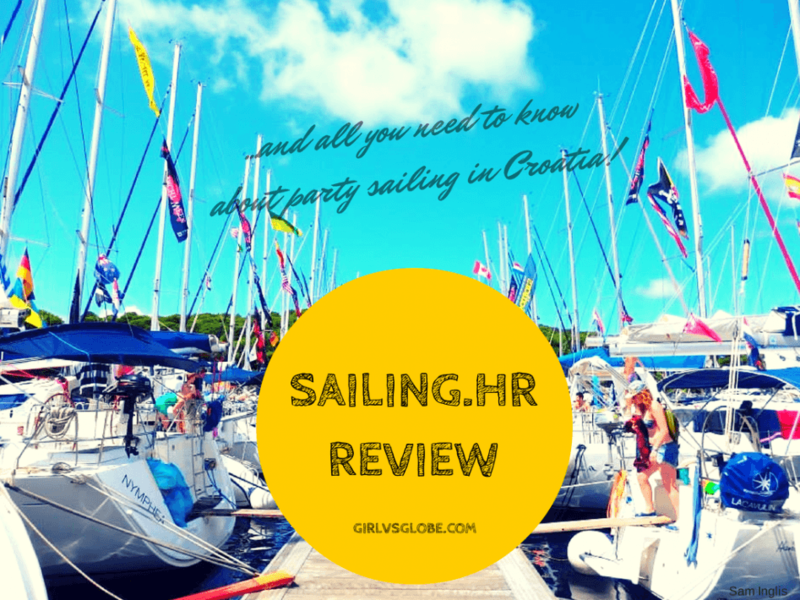 Disclaimer: My stay in Croatia was sponsored by Sailing.hr, but all opinions are my own and fully honest – as always! Main photo via Sam Inglis. Loved the trailor too and then going through your review, definitely some things surprised me but I expected it . There usually are hidden costs and numbers are exaggerated but it looked like a great time either way, minus the bad weather. Rain can be a downer but try to beat it! like you see in the video teaser. benefits .We also had a extra costs while partying with the guests. tried and we’ll keep on trying to make a special week for our crews. expensive ..like every other turist country. My name is Damir and I was Sabinas skipper during her stay with us on Sailing.hr and I must say that I cannot agree with the things she wrote in her blog and now I`m going to write a review of my own here. Some things like hidden costs exist in any company you work with. The problem I have is with the word hidden. You say they are written on the official webpage of the company and then you call them hidden costs. How can they be hidden if you can read them on the webpage? Nevermind. Now about the weather. The boat that sank the first week sank because of bad weather. If I tell you it is a 45 meter boat then you can imagine what the weather was like. You say that you did not go to see the blue cave. Do you know how dangerous it would have been if we tried to go there. Us skippers with unexperienced crew that is still hangover from the party last night. Sorry we are proffesionals and think about the safety of our guests. You say you are a travel bloger but you don`t seem to know much about tourism. When you talk about the prices you don`t seem to know that Croatia is a top touristic destination and that people from all over the world are coming to see our coast and islands in which are guests can also enjoy during THE WHOLE TRIP! You don`t say how beautiful Croatia is and that the places you have visited are really something everybody needs to experience. You only write about the parties. The programe is called party sailing. You forget to mention something about the other aspect of your trip. The islands, the bays,beaches, crystal blue sea etc. I m sorry you didn`t like what we offered but honestly to me you seemed like you were having the time of your life! people went on scuba diving or sky jumping. There was around 100E per person additional cost for the boat. As far as I managed to find out, everyone paid 50E for wristbands, which are for the entrance to clubs but also for the services of sailing.hr. Definitely, best part of the week was raft party, and I hope that sailing.hr will find some way how to organize them more often during the week if the weather conditions are favorable. I sailed with Sailing.hr in 2013 and 2014 it was the best party of my life. We were at the Ultra Music Festival in Split and Ultra in Hvar. On Tuesday, he was day party on the yacht in cove Stonca (yuo can go on military tour) at Vis until 23, from 23 fenomenal party in Castle Fod George until sunrise. There was the party to Komiži and Milni in the raft, diving on the wreck of the ship and many other fun and a top sailing and regattas. Like what you see in seven days there were nine top partiy and many daily entertainment and content. Would I go party sailing again? YES, YES, YES! Would I do it with Sailing.hr? YES, YES, YES, YES. I ve done both Yacht week and Sailing.hr in past 2 years respectively and I had much better experience with the Sailing.hr. The fleet itself was smaller but the interaction between guests themselves as well as with skippers and organizers was way more relaxed and I think that that should count most on partysailing trips… Hopefully my friends and will be partying again this year with Tibor and the rest of the sailing.hr crew! Thanks for your review, we appreciate you providing an unbiased review of our company. We insist on transparency when doing business, thus I’d like to give an additional explanations on several topics you’ve raised. Primarily, the weather conditions. Let’s agree that bad weather significantly diminishes the overall sailing experience; needless to say, we couldn’t do much about it. However, we’re aware that this shouldn’t restrict our guests in having fun as planned. This is why we’ve prepared several new activities for next year, I believe these will add on overall experience! Regarding the added costs (food, gas, docking charges…), they’re listed on our web site, as you’ve pointed out. As for entrance fees for various clubs, I’d like to point out that our company made direct arrangements with club owners, so our guests could have guaranteed access to any of them (We’ve paid them in advance). Have in mind, usually all of the clubs charge entrance fee, however we cannot be held responsible for the change of their policy in last minute (due to rainy season, some of them decided not to charge entrance fees in order to attract customers). Our company appreciates all of your input, and we’re working hard on rectifying any noticed „issues“, so every next season is better than the previous one. We hope seeing you again soon! I have to say that I almost completely disagree with above text. In my opinion, we really enjoyed with Sailing.HR. Then when we speak about extra costs, it is always like that on sailing, you always have to pay marinas, diesel, food.. etc. And always something extra comes out to pay. Then, about skipper’s decisions, if the skipper decides it is not safe to go to the sea, there is no further discussion, that is final decision, because he is in charge of your safety.. :/ I know that because I have skipper’s license and I know how can it be dangerous, no meter what the crew thinks! I am writing this too, because I was few times with Yacht week (it was really nice), and this yeas I was with Sailing.HR. And I have to say it was really really great too! We had really good time with both operators, maybe it was even more better this year because of funny and more friendly people (staff) who worked for Sailing.HR. Then, I disagree with the fleet numbers, if you go to my FB page you would find around 25 yachts in the fleet! And in that week, we had around 105 girls VS 95 guys, I remember that clearly, because we were joking the whole week about that number and how lucky we are. If you don’t believe me,you can also check my FB album, or ask someone who was there too (first week of August)! Now about deposit, you always have to pay deposit when you rent a boat, or car (it is usual thing), I didn’t catch why is it mentioned in this text, you should tell us the name of your bank, because u had problem with your bank, not with the operator..
Again I disagree, but this time with story about pricing in HR. I come from Belgrade Serbia (relatively cheap city), and when HR is not expensive to me, than it can’t be expensive to anyone! Because you are going to sailing, not to some cheap vacation. Furthermore I compared prices in Belgrade to prices in Hvar, so when you take that you are on a fancy-posh yacht vacation and those people in Hvar are living from truism and when compare those prices to our prices of drinks in Belgrade they are a little bit more expensive than in Belgrade, but guys do not make jokes with that, you are on the most fanciest place on The Adriatic sea (on vacation), so proportionally those prices are lower than they should be! And now parties on boats! It was really really great! All boats linked together in formation of flower, and DJ is playing music, and champagne shower, really great experience!! As well as party in Vis and Komiza!!! So if your are asking me, go for sure with Sailing.HR, you will no regret!!! PS. If you want to see my photos from Sailing.HR, find me on FB (Gospodin Trifunovic). just the best sailing company out there. So, seriously, go get some! I have just one comment to give to all of you thinking about sailing in beautiful Croatia: BEST POSSIBLE SUMMER VACATION YOU COULD POSSIBLY EVER HAVE OR EVEN IMMAGINE !!! Sailing.hr folks are just amazing at what they do, and I’ve tried a couple of those party/sailing companies. my name is Vibor Ceric, I’ve been cooperating with Sailing. hr for last 4 years, and I feel invited to say a few things about the issue after reading Your text. Some things You wrote simply don*t hold and are made on Your impressions, based on spending one, probably the worst week of the season considering the weather and organization difficulties that came out of it. I also haven’t got any personal interests in describing things in any way other they really were and are, since I am not their emploayee, I work for other companies as well, and I am also a doctor with my own practice, so I am not depending on them in any way. The reason I work with them is because the company is packed with great and interesting people, enthusiasts that are crazy about the sea and sailing, nature, partying, and having great, but meaningful time in general. Most of the skippers have college education, but they are also musicians, DJs, teachers, all sorts of athletes and adrenalin junkies, scuba divers, travelers, people that love and are proud of all the beautiful things that croatian coast and culture have to offer. And they can and will, if You ask them, show You special places, hidden bays, great restaurants with charismatic, little weird and authentic but nice and fun owners, which other companies with foreign skippers have no slightest idea that they even exist. A lot of people that come for the first time ask to have the same skipper their friends who recommended them Sailing.hr had on their trip, because they liked him or her so much. Yes, the company is smaller than Yacht Week, (although it is doubling every year) and there are some obvious advantages in their favor, considering organization and being able to throw a huge party. The numbers can’t be argued. If You have hundred or more ships with all the people aboard, wanting to party You’d have to be a complete moron to not to be able to organize something. So if someone’s idea of an ultimate party is to be a member of a herd, hoping that the mere statistics will decide if he or she will have a great time, than Yacht Week may be the best choice for that person. But in case You came not only to be wasted for seven days, and that only memory You can bring back home is partying, with no idea what country You are actually visiting and is there something else to see, learn or do, I would strongly suggest to take Sailing.hr. Because people here, also owing to interesting, fun and friendly skippers who know their ways around do all sorts of crazy and fun things, but most of all, they make friends, and that is why so many people come back year after year. Sometimes the fleet is not that huge but vast majority of people still have time of their lives. Believe me a spontaneous beach party with only fifty people attending can be ten times more fun than a massive Ultra fest type of thing, not that we don’t like or do Ultra. If someone wants partying with really a lot of people, he can choose top weeks with around 40+ vessels when Sailing.hr functions in the same manner as The Yacht Week in means of organization, but much better considering safety and offering extra activities. Although, when it’s more than twenty ships, one basically can’t tell the difference, is there twenty or fifty ships. There is just enough people, for everyone’s taste, and You won’t have time to meet most of them anyway. As for gender imbalance, sometimes there are more guys, and sometimes more girls also, but there is never such big difference, there is a zillion opportunities to meet someone for both ladies and gentlemen, on the fleet, at places, clubs we go to, other ships, everywhere. One just needs to keep eyes and heart open 🙂 And it is simply not true that there was only one trip or extra activity that one could do that week You were attending there were at least one on every island we visited. Scuba diving, both for divers and first time discoveries, sky diving, famous military tour on Vis Island, wine tasting etc..Since they are all charged extra, as it says in brochure, why would someone miss the opportunity to make money, and at the same time risk to have an unsatisfied guest. But it is true that the Blue Cave was skipped. With the weather we had and waves hitting the entrance to the cave, it is actually a life hazard, and we take care of safety. And if You party in Aquarius all night You don’t go next morning to Blue Cave under such weather. And all this years there was never any serious accident on Sailing.hr trip. Which would not be the case with The Yacht Week. And we also always have medical professionals on board just in case, but only interventions that are usually needed are treating people from hangover or getting those sea urchins spines out of their feet. So once again, to conclude, Sailing.hr is a party-sailng company but also a company for anyone who can look further than just partying, they offer a lot more impressions to bring back home, and although they do offer partying like hell, they will also organize other fun things to do and make sure You’ll have the most memorable time. Jesus wtf is wrong with those people here? As if it helped spamming this blog post with “positive” comments about the company… anyways, I like that you wrote honestly! It’s a shame that you had bad weather, but great that you had a good time anyways! Wow they are not enjoying your review- look at how many false reviews their HR department has managed to leave you! I took part in this programme- sounds a bit like it was the same season as you (as i was there when the big party ship sank). Your review is spot on- if not too nice. rip off, wrist bands were a scam, never got to do any of the activities and didnt follow our schedule what so ever- the worst part was the zero communication about all of this from staff, and zero remorse from them at all! could rant all day about it. Good on you for being honest! Hi Greg! Thanks a lot for speaking up on my behalf 🙂 All of these “reviews” below are so blatantly fake that I never bothered replying… The company still owe me money, but I’m not pursuing it because I just really wanted to wash my hands off the entire affair. A very unprofessional company, in my sad experience. Jeesh, reading through these comments is not fun, I feel for you! Cheers to you for valuing your readers and writing honestly for them! It was not an easy situation you were put in, and you clearly had to take a lot of backlash for it. Well done Sabina! Handled that one with integrity. Hi there, I’m going to do a sail in Croatia next year and I was tossing up weighing the options after reading this I know which company to go with the yacht week! I was cruising Adriatic last year. Booked a sailboat for 2 weeks via agency ( https://sebastus.com/ ), it was beautiful. I’m sorry you didn’t like your trip in Croatia. If you ever decide to come back, try booking a boat at Miomare yachting. My friends recommended them to me and I loved it.